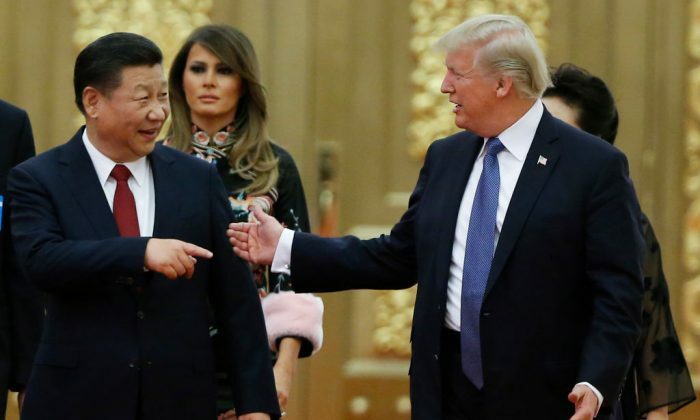 Beijing is downplaying its 10-year economic program “Made in China 2025” in the Chinese media now that the industrial policy has become the target of tariffs by U.S. President Donald Trump, as revealed in a document circulating on Chinese social media. Chinese media were also told not to report on comments made by Trump, U.S. government spokespeople, or other U.S. officials. They were also told not to report on commentaries made by American media and to instead wait for official responses from China’s Ministry of Commerce. The document demands that media tone down any reports that might suggest a connection between the Chinese stock market—which plummeted on June 19 after Trump threatened tariffs on another $200 billion of Chinese goods—and the trade disputes. While the document warns media not to use “vulgar” remarks to attack Trump, it says media reports should be precise in their attacks to “disintegrate the different groups within the United States,” a consistent part of the Chinese regime’s propaganda. The Epoch Times could not find the original document on Sina Weibo at the time of writing. The post was likely deleted by online censors. The Chinese regime unveiled the Made in China 2025 program in 2015, announcing the goal of achieving 70 percent self-sufficiency in 10 high-tech industries, including advanced information technology, robotics and automated machine tools, and aircraft, by 2025. The program has been compared to Germany’s “Industry 4.0″ policy, which aims to create a “robust and innovative manufacturing industry” with the tools of information technology. Though the authenticity of the document could not be verified, its reported contents coincided with a report by Reuters, which cited an unnamed senior Western diplomat as saying that in recent meetings with Chinese officials, they have downplayed Made in China 2025, claiming that some of its more controversial aspects were merely proposals by academics. China state media Xinhua, which made more than 140 mentions of Made in China 2025 in Chinese-language news items in the first 5 months of the year, has not done so since June 5, according to Reuters. The diplomat said some Chinese officials have gone so far as to suggest it was a mistake for the government to have pushed the plan so forcefully and publicly because it had increased pressure on China. “China is apparently starting to adjust to the blowback caused by the heavy [Chinese] propaganda,” the diplomat told Reuters. In recent years, the Chinese regime has mainly resorted to two tactics to realize its economic ambitions: acquiring foreign firms and forcing technology transfers. U.S. regulators have become increasingly wary of Chinese acquisitions and blocked several deals due to national security concerns. But as recently as January, China was still going after American technology: the Beijing-based Naura Microelectronics Equipment successfully acquired Akrion Systems, a U.S. company that makes semiconductor manufacturing equipment, according to Reuters. In June, LG Display, a subsidiary of South Korean conglomerate LG Corporation, was pressured by the Chinese regime to transfer its OLED technology, which is used in making advanced display panels found in television screens and the latest iPhone X screens. Chinese authorities threatened to block LG’s proposed manufacturing plant in Guangzhou City in southern China if it did not do so. There is already evidence that China does not intend to give up the goals outlined in Made in China 2025. Xinhua has removed a June 6 article about southern China’s Fujian Province turning itself into a model area for Made in China 2025, but the article is still posted on the Fujian government’s official website. On June 24, Global Times, a state-run newspaper with an overt chauvinistic slant, dropped its typically hawkish positions when it published remarks by Liu Yadong, editor-in-chief of another state-run publication, the Science and Technology Daily. In a speech given on June 21, Liu was critical of those who said China was leading the world in economic and technical prowess, saying that the reality is, China lags far behind the United States and other advanced countries.